Corporate Branding or Business Branding shows the identity of your business to the public. It is how the world perceives and engages with your brand. Though your business identity is more than just your logo, product design and trademark, the way your business is presented to the public make an enormous difference. Fonts expand more than just being used in your logo. 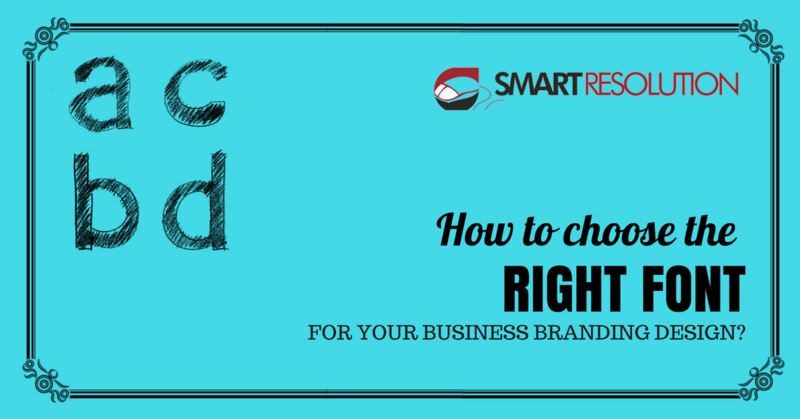 Choosing the right font for your logo, website, presentation, and other marketing materials reflect your brand’s character. Hence, it has to be carefully chosen. Though each of these headlines is worth being written as a blog by itself, here are some simple and useful hints to choose the perfect font for your brand’s identity. The first rule that overrides almost everything else while choosing a font is the readability aspect. Irrespective of what font type, case, space, format or color, your logo has to be legible. In case of marketing materials, content has to be pleasant even while reading for long periods of time. When you choose the case for your logo, it has to be dependent on the font type you choose. For example, luxury fonts are more elegant in all small letters than capital letters. For website and marketing materials, don’t use all caps unless it is necessary. Logos should have adequate clear space between letters and words. To maximize the impact of your logo, clear usage guidelines need to be given internally and for third-party. Clear instructions explaining the space that needs to be present around your logo should be given. There are a lot of attributes to be considered like weight, style, condensation, width, slant, italicization, ornamentation, and more. These aspects give trivial variations when used independently but when used together, can bring a colossal difference. Brand color plays a major role in being on top of consumers, clients or users’ minds. Most of the time, successful brands are synonymous with their brand colors. You can’t think of Coca-Cola without their red color; Pepsi’s red, & blue or McDonald’s red & yellow arch. Contrast is another tool which has the power of making a brand identity by itself. Colors and contrast between colors need to be carefully chosen synchronising with your brand and product/service. It is important to decide whether you are planning to use a single font for your logo or mix different font types. If you plan on the latter, make sure the fonts complement each other. For example, serif and sans serif complement each other well. While mixing, you need to concentrate on font types with similar heights. Though not of high importance, it might be worth searching for the recently trending typefaces that are exciting. We hope this will put you well on your way to creating a fabulous logo, but should you require some help, please feel free to ask us at any time! Head on to our Logo Design Services page, if you need professional help.